Clay Aiken – The Spark Begins With You! It is always a good day when you hear from Clay Aiken. On Wednesday and Thursday, Clay and his team reached out to his supporters and shared some news via Twitter. 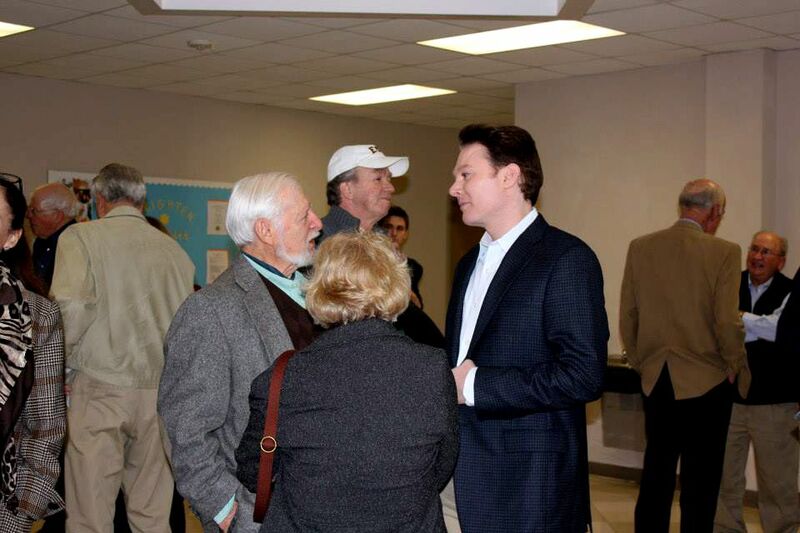 Another day on the trail for @clayaiken. The support that you all give him has shown the press that #clayfornc has momentum. We live in an era of political dramas such as House of Cards and Scandal which portray Washington D.C. as a place featuring ever shifting alliances among the powerful and those seeking power, back room deals, and special interests dominating the direction of our government. These shows are fictional, but sadly the reality of Washington D.C. is too often almost as bad. A recent article pointed out that many Congressmen “vote no, but hope yes” because they want to appease the special interests and the far right or far left by voting no, even as they understand that certain legislation must pass for the good of the country. Isn’t it time that we have representatives who do the right thing regardless of what the special interests think? The people that our elected officials represent should be the only special interest that they care about. Period. My campaign reached out to you on Monday to share with you that we are building out the campaign. Since that time we have finalized office space, made a number of hires which will strengthen our campaign, and I’ve hit the trail throughout the district meeting with voters. We’re building a campaign that we can be proud of, but we still have much to do. Will you chip in $10, $20, $50, $100, or whatever amount that you can afford today to help us keep going? I told you when I entered this race that I hope to show everyone that at least in our corner of North Carolina that we can have a Congressman who represents everyone in the district, not just those who voted for them. I also want to be the type of Congressman who votes out of the best interest of the people of the Second District. You shouldn’t have to have a lobbyist or Super PAC to be heard and I will always be a Congressman who listens. For years I’ve encouraged everyone that I meet to use their voice. I intend to represent that spirit in DC. Will you use your voice today by donating $10, $20, or more to our campaign and forwarding this email to five of your friends and ask them to do the same? We have the opportunity to spark much needed change in Washington. That spark begins with you, right now, and that spark can grow in to a flame that entrenched power can’t stop. PS – Consider contributing what you are able today to keep the campaign growing. CANN reminds our readers that citizens of other countries cannot donate to Clay’s campaign. Be sure and stop by and see the new tabs at the top that give you new information about Clay and his campaign. And…maybe you will just Have to watch the “Open Door” video again! This post has a lot of important information about Clay and his campaign. Let’s try and keep it visible on Google, FaceBook, and Twitter. That means comments, likes, and tweets/retweets! Tags : Clay Aiken, Clay For North Carolina, ClayForNC, FaceBook, Google, House of Cards, MSNBC, North Carolina’s 2nd Congressional District, Twitter, Use Your Voice, Washington D.C. The key words in Clay's statement above are "I need to stop doing what I'm doing, stop singing……" That is confirmation to me, that he has left the entertainment biz with a good chance that its permanent if he gets the nomination. While I wish him all the best in his bid for Congress, I would rather he stay in the entertainment world and sing. However, whatever happens, I'm not going anywhere and will always love him to pieces! Great blog Musicfan. Always enjoy your posts. Clay once said that he did not see how his getting more famous could help anyone else. I believe he has many talents much greater than his singing or acting abilities, which are truly enormous. Clay seems to identify with those who are outcast or unfortunate and naturally reaches out to them, lifting them up and giving them hope. He is not afraid to speak out when there is mistreatment, unfairness, or oppression of any kind. During last year’s appearance on “American Idol”, Clay said the show had given him a microphone to sing but that he also wants to use that microphone to talk about serious matters that affect our world. While I will certainly miss his “entertainment side”, I admire and support his current direction and pray he will make a difference in Congress for the people of this nation. And who knows, perhaps his singing and warm sense of humor may still play a part in his life. Clay is a man of many colors!! I plan sit back and take in all of them. Error: Error validating access token: Session has expired on Tuesday, 21-Aug-18 16:13:01 PDT. The current time is Saturday, 20-Apr-19 02:08:26 PDT.